Day 1: Vancouver Upon arrival into Vancouver, please make your own way to Canada Place to board your Holland America Cruise Ship. Day 2: Scenic Cruising the Inside Passage The fabled Inside Passage is one of the most scenic sea-lanes in the world, and one of the few where deep-draft vessels can sail close to steep mountain walls. The scenery is unbelievable, with forests in a hundred shades of green, tumbling turquoise glaciers, and evocative towns loaded with history, culture and adventure. 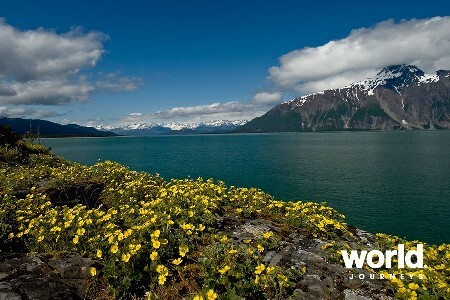 With most of Southeast Alaska accessible only by boat or plane, the Inside Passage is a lifeline to the outside world. All day long it hums with activity. Day 3: Tracy Arm > Juneau Nestled between 3,000-foot high granite walls, the narrow, twisting slice of ocean called Tracy Arm Fjord weaves through the Tongass National Forest for roughly 35 miles. The shoreline is spotted with waterfalls created by melting snowcaps and trees sprouting at odd angles from rocky outcroppings. The dramatic Sawyer Glaciers at the end of Tracy Arm are framed by mountains on either side, and are often bathed in a light mist that amplifies the blue hue of the ice. The glaciers also are home to black and brown bears, wolves, deer and moose, and seals and whales make their home in the fjord's icy waters. No roads lead to Juneau, which gives the Alaskan capital a misty inscrutability. You need to come by air or water, but when you arrive, the place will delight you with its bounty of water, forests, and mountains. Squeezed between the Gastineau Channel and Coast Mountains, Juneau offers a lot of variety in close proximity. The massive Mendenhall Glacier and the immense Juneau Icefields are at its back door. The vast Tongass National Forest stretches away to the northeast. 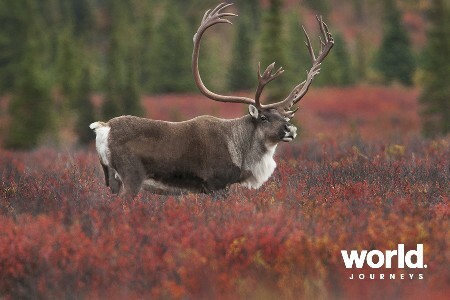 You can shop downtown or get out and kayak, dogsled, raft, hike, whale watch, flight see or fish. The adventures are as bountiful as the daylight. Day 4: Skagway Some of the aspiring Klondike gold rushers who made it to Skagway took a look at the 500-mile journey that still lay ahead of them and decided a change of profession was in order. So many of them set up shop as provisioners that Skagway was the largest city in Alaska by the end of the 19th century. Booms fade and dreams move on, but the glory days still reverberate through the town. 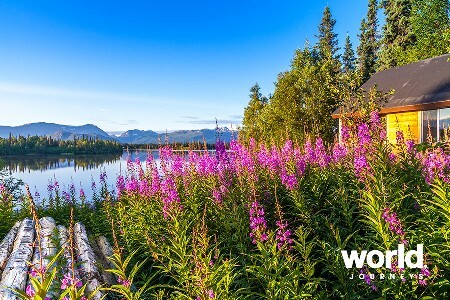 Ride the antique White Pass & Yukon narrow-gauge railway, step into the Red Onion Saloon or peruse the restored buildings and wooden boardwalks of the Klondike Gold Rush National Historical Park. Day 5: Glacier Bay Scenic Cruising If you didn't know any better, you'd think Glacier Bay ostentatious for the way it flaunts its ice. The glaciers practically terminate in your lap. 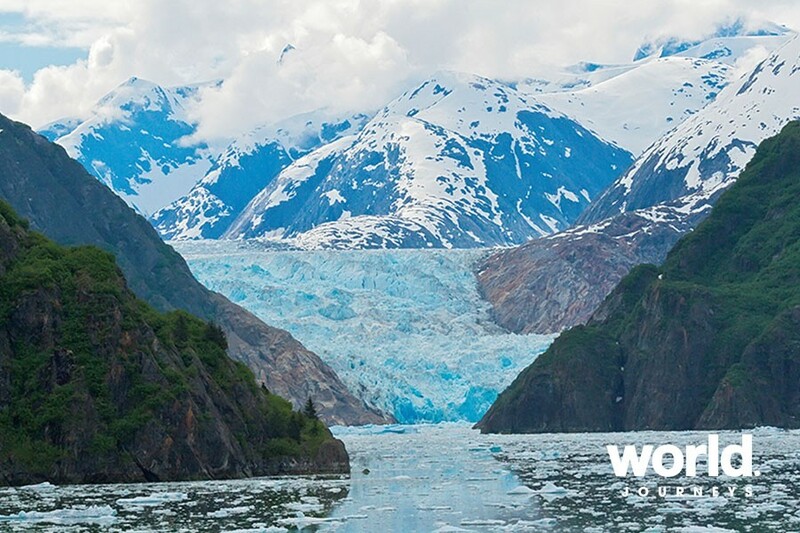 A cruise to Glacier Bay National Park with Holland America Line will show you a UNESCO World Heritage Site that protects a unique ecosystem of plants and animals living in concert with an ever-changing glacial landscape. When a monumental chunk of ice splits off a glacier and thunders into the sea the impact shoots water hundreds of feet into the air. You hold your breath as you catch the moment on film. Then you wait for it all to happen again. And it does: Glacier Bay has more actively calving tidewater glaciers than anyplace else in the world. Day 6: Ketchikan Ketchikan clutches the shores of the Tongass Narrows, with many shops and houses built right out over the water. The stairways are weathered and the vibe is cheerful in the town that calls itself the Salmon Capital of the World. 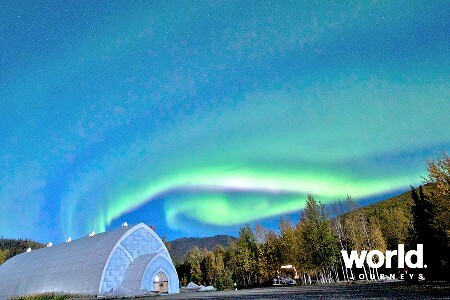 Besides the main attractions - Creek Street, the Tongass Historical Museum, Totem Bight State Park and Saxman Village. Day 7: Scenic Cruising the Inside Passage Spend the day relaxing onboard the ship as you cruise on the Inside Passage. Disembark your cruise ship and transfer to your overnight accommodation. Please note: Your scheduled check in time is not until 4:00 pm. In the event that your room is not ready, your luggage will be stored and you are free to explore this scenic city on your own. 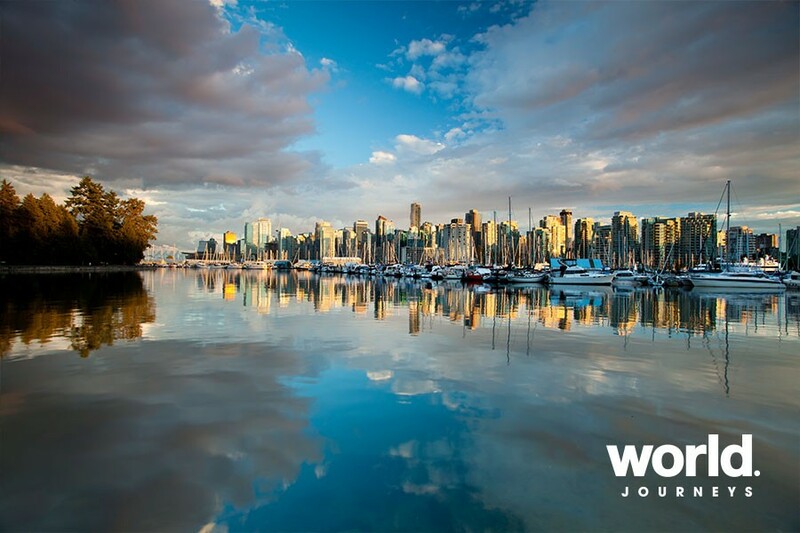 Day 9: Vancouver Sightseeing Enjoy a six-hour sightseeing tour of Vancouver's spectacular North Shore. Travel across the Lion's Gate Bridge and into the Coast Mountains. Experience the Capilano Suspension Bridge and Treetops Adventure, discovering the coastal temperate rainforest and British Columbia's First Nations heritage. Next, visit Grouse Mountain (gondola admission included), the Peak of Vancouver and take the breath taking views of the city, ocean, and surrounding mountains. Day 10: Vancouver > Kamloops(Train) Travel onboard the Rocky Mountaineer from the coastal city of Vancouver to Kamloops, in the heart of British Columbia's interior. 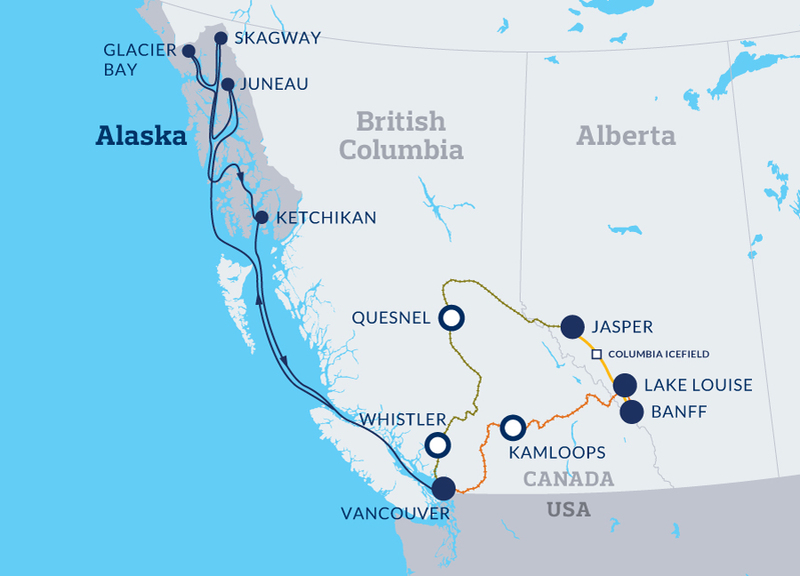 On today's journey you will see dramatic changes in scenery, from the lush green fields of the Fraser Valley, through forests and winding river canyons surrounded by the peaks of the Coast and Cascade Mountains, to the desert-like environment of the BC Interior. Highlights include the rushing waters of Hell's Gate in the Fraser Canyon and the steep slopes and rock sheds along the Thompson River. Your day concludes as the Rocky Mountaineer travels along the shores of Kamloops Lake into Kamloops. Day 11: Kamloops > Banff(Train) Your journey continues eastwards to the mighty Canadian Rockies and the province of Alberta. Once again you will see a spectacular array of scenery as you travel across ranchlands, along rocky lakeshores, over high mountain passes and through the remarkable tunnels that form part of the rich rail history of the Canadian Rockies. Today's highlights include Craigellachie, where the last spike of the Canadian Pacific Railway was driven, the climb over Rogers Pass, Kicking Horse Canyon, the Spiral Tunnels and, of course, the glaciers and snow-capped peaks of the Canadian Rockies. Your rail journey ends this evening in the resort town of Banff. Day 12: Banff Sightseeing This morning you are free to explore scenic Banff on your own. After lunch (own expense) enjoy a half day sightseeing tour of Banff and Banff National Park. 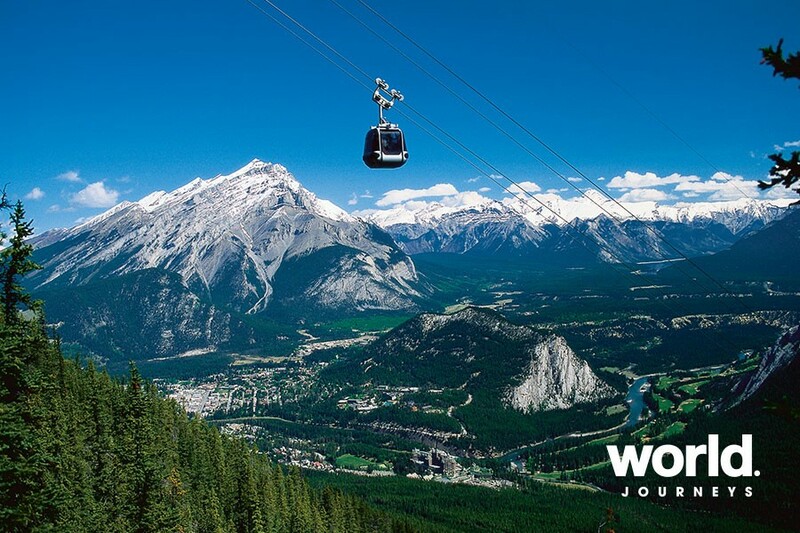 Among the highlights are visits to Bow Falls, the Banff Gondola (admission included), Lake Minnewanka, Surprise Corner and the Hoodoos. Day 13: Banff Today you will have an entire day to spend exploring Banff National Park on your own. Optional activities include soaking in the mineral pools at Upper Hot Springs, enjoying a nature walk on nearby mountain trails, visiting Banff's historic museums, cruising on Lake Minnewanka or playing a round of golf at The Fairmont Banff Springs. 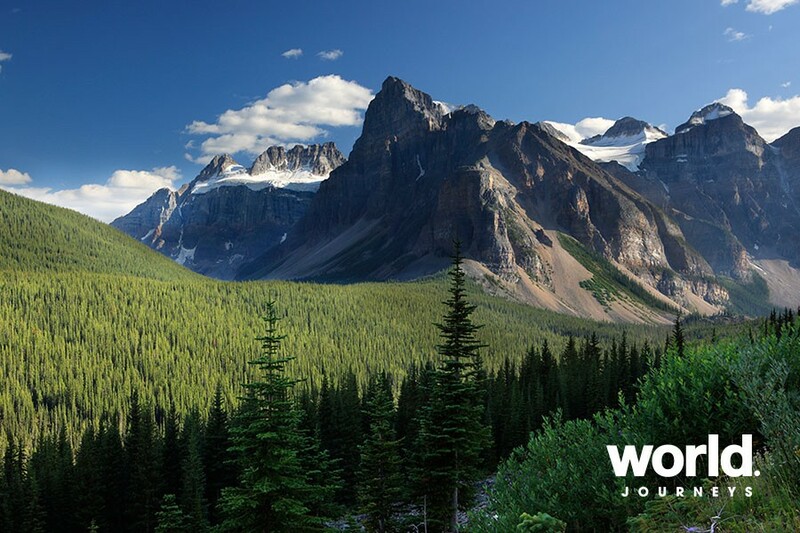 Day 14: Banff > Lake Louise A half-day tour takes you into Yoho National Park to view some of its natural wonders. 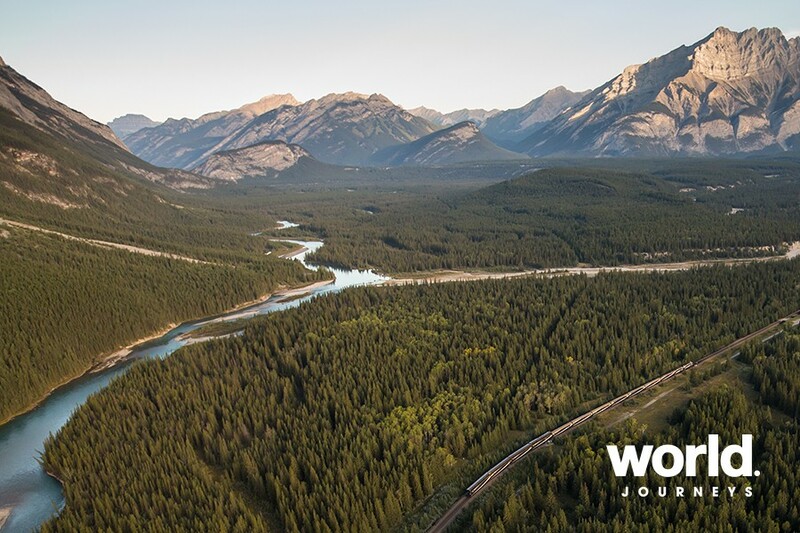 Among the attractions are the Spiral Tunnels, Emerald Lake and a natural rock bridge spanning the Kicking Horse River. The tour ends in Lake Louise where the remainder of the afternoon is at your leisure to enjoy this magnificent location. Day 15: Lake Louise Enjoy a free day in Lake Louise. Local activities include canoeing, hiking in the mountains or simply relaxing and taking in the magnificent views. Day 16: Lake Louise > Jasper(Bus) Enjoy a sightseeing tour of Banff and Jasper national parks via the Icefields Parkway. Among the highlights are Bow Lake, the Columbia Ice field, Glacier Skywalk and Athabasca Falls. The Columbia Ice field is one of the largest accumulations of ice south of the Arctic Circle and one of the most accessible ice fields in North America. Here you will ride on an Ice Explorer to the middle of the Athabasca Glacier to learn more about its geological features. Lunch is included at the Columbia Ice field Glacier Discovery Centre. Arrive in Jasper late this afternoon. Day 17: Jasper Jasper National Park is a UNESCO World Heritage Site and the Canadian Rockies' largest national park. Today you will enjoy a scenic half-day tour of some of the park's natural attractions and rugged peaks, and perhaps catch a glimpse of the wildlife that calls this region home. Lunch is included today. The remainder of the day is free for you to explore more of Jasper independently. Day 18: Jasper > Quesnel(Train) Travel onboard the Rocky Mountaineer from the mountain resort of Jasper in the Canadian Rockies to the charming rural town of Quesnel, gateway to the North Cariboo. 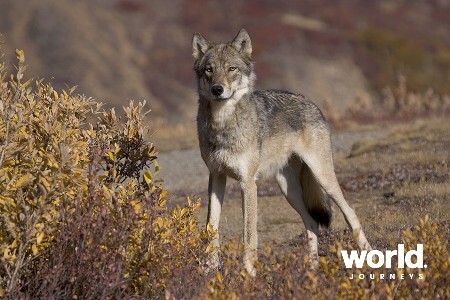 Pass through the Rocky Mountain Trench, with the steep Rocky and Cariboo Mountains either side, and on to the rolling hills and vast forests of British Columbia's Northern Interior. Highlights include Mount Robson, the highest peak in the Canadian Rockies, Yellowhead Pass and Moose Lake. Your day concludes as the Rocky Mountaineer passes through the town of Prince George and follows the Fraser River into Quesnel. Breakfast and lunch will be served onboard the train. Day 19: Quesnel > Whistler(Train) Your journey continues south today to the four-season resort of Whistler. Enjoy breathtaking and varied scenery, from the desert-like conditions of the Fraser Canyon, through the rolling hills and vast ranchlands of the Cariboo Plateau, to the river canyons and lush farmland of the Pemberton Valley. Highlights include sweeping views of the Fraser Canyon, the crossing of Deep Creek Bridge, one of the highest railway bridges in the world, and the shorelines of glacial-fed Seton Lake and Anderson Lake. Your rail journey ends today on arrival in the resort town of Whistler, host of the 2010 Winter Olympic Games alpine events. Day 20: Whistler > Vancouver(Train) The morning is free to explore Whistler Village at your leisure. This afternoon return to Vancouver onboard the Rocky Mountaineer through the stunning scenery of the Sea to Sky Corridor. Highlights of the trip include the Cheakamus Canyon, the dome peak of Mount Garibaldi, Brandywine Falls, and breathtaking views of Howe Sound and the Coast Mountains. An afternoon meal is served canapé style. On arrival at the North Vancouver train platform, you will be transferred to your accommodation in downtown Vancouver. Day 21: Vancouver Your journey ends upon checkout from your Vancouver hotel. 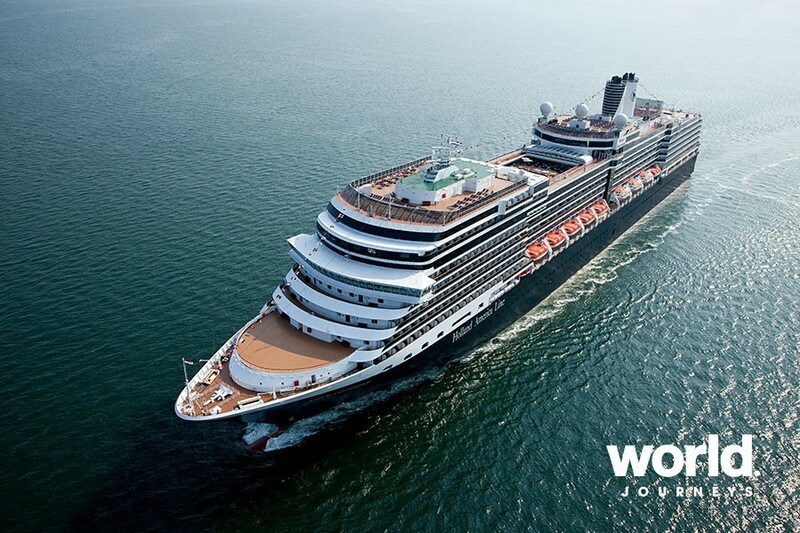 The ms Nieuw Amsterdam exemplifies the classic style of ocean travel with contemporary amenities and modern enhancements. The ambiance of the elegant ms Nieuw Amsterdam will provide a comfortable, spacious and relaxing backdrop as you sail up the Pacific Coast to picturesque Alaska. 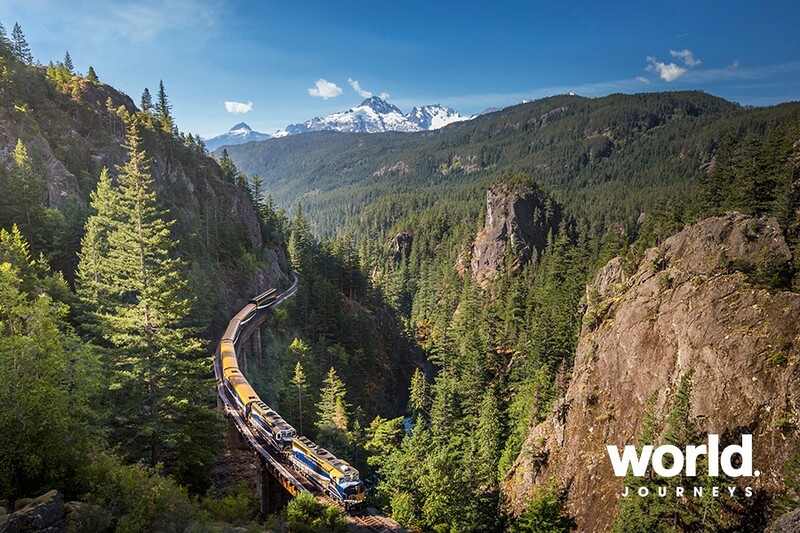 Until May 31, 2019 book a qualifying 2019 Rocky Mountaineer package of 5 days or more and receive a FREE hotel night in Seattle, Vancouver, or Calgary. Make your journey through the Canadian Rocky Mountains even more unforgettable with a complimentary night's stay in one of these world-class cities. Offer applies only to new 2019 bookings made by May 31, 2019 for qualifying Rocky Mountaineer packages booked in GoldLeaf or SilverLeaf Service for travel during the 2019 Rocky Mountaineer season on selected dates. Further terms and conditions apply, please contact World Journeys for more information.